- Allow user to share report via Facebook, Twitter, Dropbox etc. via Airdrop. 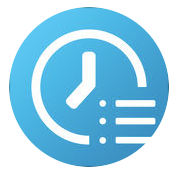 - Changed the layout of current duration and total duration for task in today tab, so the total duration text is bigger as it is more important for time tracking. - Added web sync to ATracker.pro site. - Added a muted notification sound. - Improved PDF generation for bar chart view, especially for monthly view with a lot of items. - Support multitasking for iPad, with Split View and Slide over. - Rewrite app with improved icon handling, make the icon selection lighting fast. - Support export report data to "Files" for iOS 11 users.